Three Alton strikes and Chaminade was out. Successive 3-pointers from Ky’lun Rivers, Donovan Clay and Clay again to open the third quarter extended a one-point lead to 10 and sent the Redbirds to a 67-59 boys basketball victory over the Red Devils in the championship game of the Belleville East Tournament. 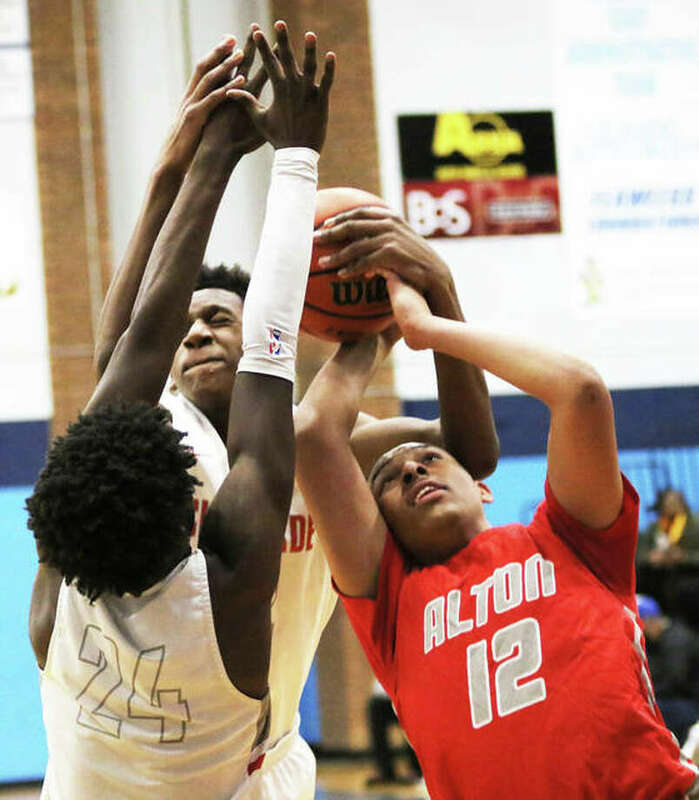 Alton improves to 13-8 and continues a busy stretch with games Monday against Soldan in a shootout at Saint Louis U High and Tuesday at home against Edwardsville. Chaminade, the two-time defending tourney champion, drops to 9-6. Malik Smith, who missed three games for undisclosed cause, before returning to the lineup for tourney play in Belleville, capped his all-tourney team week by scoring 19 points against the Devils. Rivers scored 13 points and Andrew Jones added 10 points for Alton. The Redbirds labored early in the game, settling for quick 3s without much success. Jones halted that trend by getting some penetration through the lane to help trigger a second-quarter surge that gained Alton a 29-23 halftime lead. Chaminade would draw within one point after three quarters, but the Redbirds’ Rivers-Clay-Clay 3 spree ignited a 27-point fourth quarter that put away the Devils. Alton, which went 9 of 28 from 3-point range, got eight points – all in the second half — from tournament MVP Clay. Luke Kasubke, who averages 23 points per game, scored 15 points to lead Chaminade. Tarris Reed Jr., a 6-7 freshman, scored 14 points and Matteus Case had 13 points for the Devils.